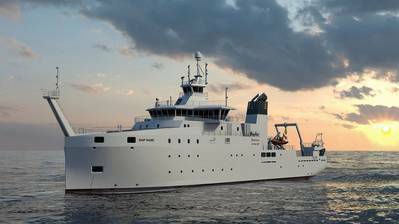 Spanish shipbuilder Freire is constructing a new oceanographic research vessel for Belgium. The IMO polar code compliant vessel will be designed to carry out research and survey tasks in the North Sea and its adjacent sea areas, but also in the Mediterranean and more northern areas. Rolls-Royce said it has been awarded a contract by the shipbuilder to deliver ship design and equipment systems for the vessel, which is to replace the current RV Belgica. The vessel will be a UT 844 WP design from Rolls-Royce. In addition to ship design, Rolls-Royce will supply the main propulsion system, including side thrusters, Promas integrated propulsion and maneuvering system, power electric system and steering gear. A vital part of the systems delivery is also automation and control systems such as the propulsion control system, Unified Bridge and dynamic positioning (DP). The project team responsible for the new research vessel is formed by the Belgian Defense, the Belgian Science Policy Office (BELSPO) and the Royal Belgian Institute of Natural Sciences – Operational Directorate Natural Environment (RBINS-OD Nature). Detailed engineering and construction will take place at Freire’s shipyard in Vigo, Spain and the vessel is scheduled for delivery toward the end of 2020. Rolls-Royce currently has design and system deliveries for two other vessels under construction at Freire Shipyard.